LIfe’s not easy sometimes when you’re a battery startup. 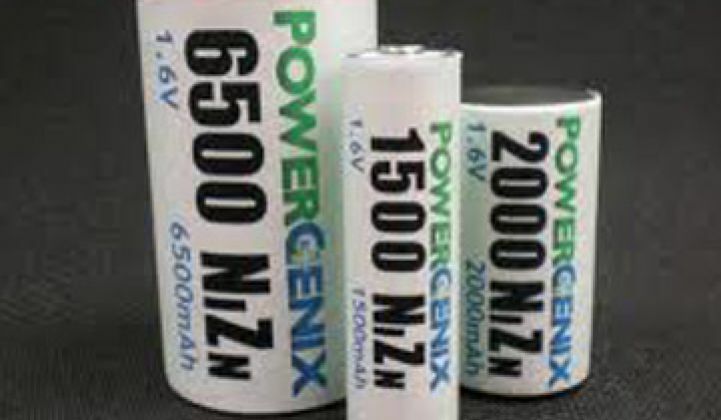 PowerGenix, the nickel zinc battery startup, is dramatically retrofitting its strategy to better fit with the realities of the battery market in what could become a last stand. The company started to sell AA rechargeable nickel zinc batteries -- a technological feat that’s been in the works for around 100 years -- last year through retailers like Amazon and Fry’s Electronics. Unfortunately, it’s not easy to get paid, said CEO Dan Squiller during a meeting at GreenBeat, which is taking place at Foothill Junior College Stanford University this week. It can take six months from when the batteries come off a manufacturing line in China until a retailer sells the batteries and pays for them. “For an early stage company, that is not a great model,” he said. As a result, PowerGenix will sell this division. Instead, PowerGenix will now concentrate on larger, prismatic (i.e., square) batteries for hybrid cars and micro-hybrids, with a particular emphasis on the latter. Think of a micro-hybrid as Hamburger Helper for gas mileage. Cars don’t drive on these electric motors and battery systems. The micro-hybrid system itself exists to take the car from zero miles per hour to cruising speed. A micro-hybrid system can improve gas mileage by 6 to 10 percent, he said. The qualification cycle is also quicker than the qualification and testing cycle for batteries for a full-fledged hybrid or regular car. By 2015, 32 percent of batteries sold to hybrids will be made for micro-hybrids. “There will be a hundred models (of micro-hybrids) in two to three years,” he said, particularly in Europe and Asia. “It’s a cost-effective way to meet CAFÉ standards. “All of our development efforts are on large-format prismatics for micro-hybrids,” he added. PowerGenix will start to ship samples to prospective customers at the end of the third quarter next year. PowerGenix earlier retrofitted a Prius with its batteries and talked about moving into the car market. But with the sale of the retail unit, cars necessarily move to center stage for the company. Getting a major car maker to adopt batteries from a startup won’t be easy. Tesla Motors, Ford, General Motors and other EV makers have all opted for batteries from established manufacturers for electric cars. Makers of conventional hybrids also tend to buy their batteries from large conglomerates. PowerGenix’s calling card will be technological advantages. A PowerGenix battery pack for micro-hybrids might weigh 7 kilograms. An equivalent lead acid pack might cost 40 kilograms. A lithium-ion pack won’t weigh much but it will cost more than the nickel zinc batteries. Still, the rechargeable nickel zinc batteries from batteries will have to compete with well-established nickel metal hydride batteries for micro-hybrid contracts. Squiller also admitted that the company is trying to raise $20 million. It has already raised $61 million. Will they make it? Battery startups Imara and Firefly Energy have already bit the dust. A123 Systems went public but has struggled to achieve profitability. VC investors have become more skeptical of battery startups. Other companies like ZPower have struggled to gain momentum for zinc-based batteries. Nonetheless, the chemistry is compelling.